Recovering Working Mom: New meaning to the phrase "finger sandwiches"
I absolutely despise making lunches. I know I cannot be the only mommy out there who feels this way. I would rather risk that my children put all kinds of junk food in their lunches than have to make them myself. Unfortunately for them, there is no junk food in our house, and I have actually convinced them that Veggie Sticks is junk food! Not sure what my aversion to this task is, but I hate it. AND, I also am unwilling to let my children buy lunch everyday from the cafeteria. So, until I can get a “Rosie” Robot to make the lunches for me, I’m stuck with it (this is, by the way, one of the things I miss about working motherhood – paying the nanny to make lunches). I know, hard life. 1) Seriously, I thought it was a good idea to turn a task that I loathe into an hour and ½ project?! There was no “family” in this family fun activity. Imagine asking your 5 year old to cut out a skeleton shape out of sandwich bread . . . freehand. 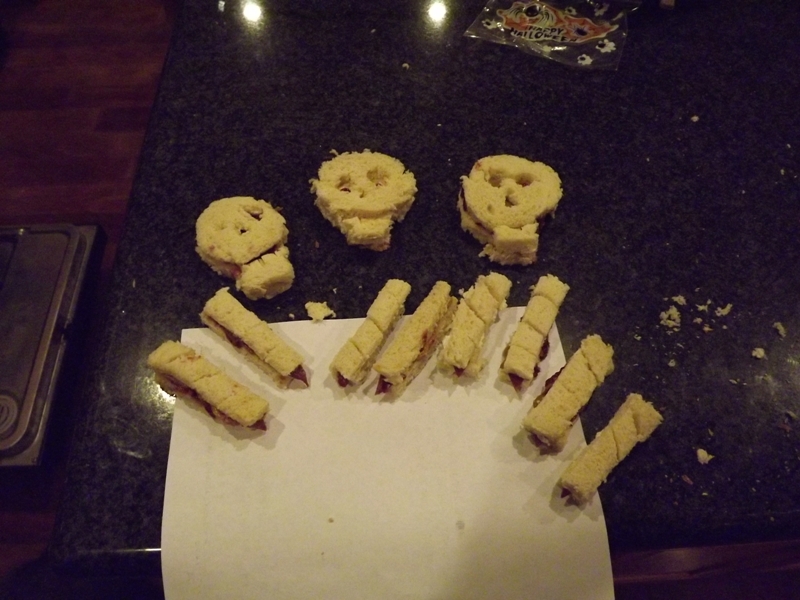 So, mommy spent 25 minutes cutting out the skeleton shapes for the heads of the skeleton sandwiches. 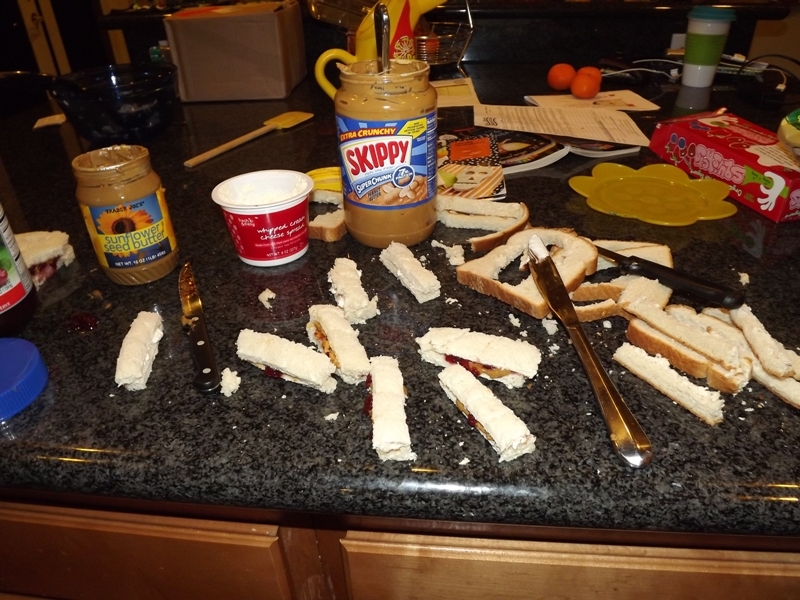 The fingers were a lot easier to cut out, but here’s a tip – put the PB&J on BEFORE you cut the finger strips. I had to put it all onto the tiny strips individually. Ooooops. The fingernails for these were small triangles cut from fruit roll ups. The 9 year-old took care of that task. 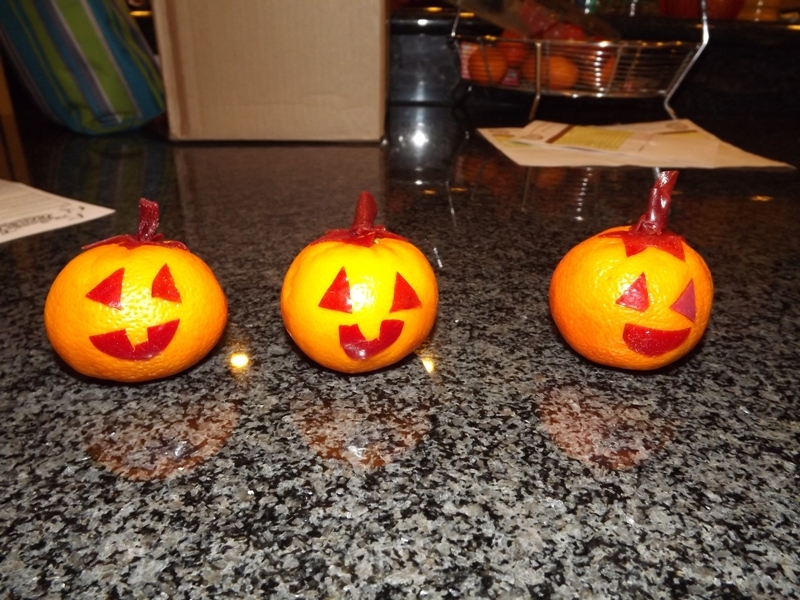 3) When cutting out the shapes for the orange jack-o-lanterns, do not expect the fruit roll-ups to actually stay stuck on the orange. You could use superglue, but I’m pretty sure the FDA hasn’t tested whether that would seep through an orange peel and be toxic. Instead, just leave the Jack-o-lanterns out on the table for the children to find at breakfast and THEN shove them in the lunchbox. You’ll get no credit with their friends for having spent an hour cutting out little faces out of fruit roll-ups, but your kids will know! As if that gets you any points!!! I got tired by mouth #3, so it doesn't have teeth missing. have the wrapper on it. 4) You know you’ve embarked on ridiculous family fun when even your husband notices the huge mess. different filling for their sandwich. Tip for today – every once in a while, make your kids an unexpected lunch. 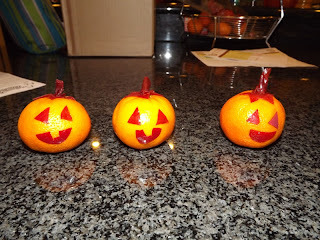 These were a pain in the @$&, as are many of my family fun activities, but when I saw the end products, I realized how fun it was for the kids. Shortcuts you can take for this one are to use a cookie cutter for the sandwich shapes. Also, like I said, the fingers would take just a few minutes and would be a fun thing to surprise the kids with. For the jack-o-lanterns, I have no shortcut. If anyone has an idea, please share.